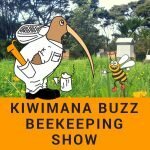 This is Episode One hundred and thirty of our beekeeping show. 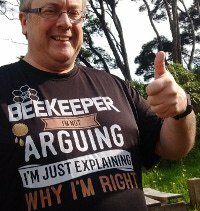 Gary's crazy idea – Interview Beekeepers without computers, do you know anyone? Some folks ordered DECA checks but had swarms which had no brood in, these cannot be signed-off as AFB checks require the presence of capped brood because if AFB is present it will only show in the brood frames. Our breeder confirms the nucleus colonies are progressing and a couple of weeks away…yeehaaa…. Students who took our courses are really being proactive on their varroa monitoring and treatments so very impressed with their efforts and the most important thing is that they will benefit from their proactive work and results are that they will have healthy productive Honey Bees…awesomeness banaNas !! 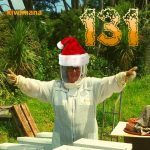 Niklas is a sixteen year old beekeepers from Switzerland, who produces his videos in German and English. 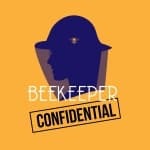 Check out Mandy’s fantastic beekeeping podcast “Beekeeper Confidential”. Hi both, Enjoying your newsletters. Many thanks from Cambridgeshire UK. Just going into autumn season for me now, but preparations for spring have already started for me and hope to be completed by Christmas. What products have we have been using in our work? 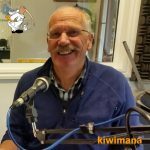 Gary – We have a new recorder that we are using in this weeks show, does it sound any different? 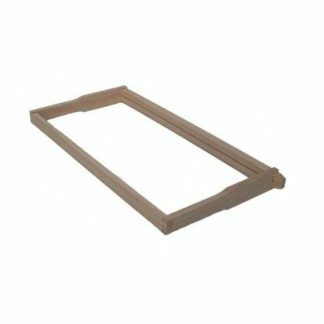 Margaret – I have been using my frame holder alot because it makes it easier for me to inspect my frames and keeps them off the ground so no bacteria goes into the hive. 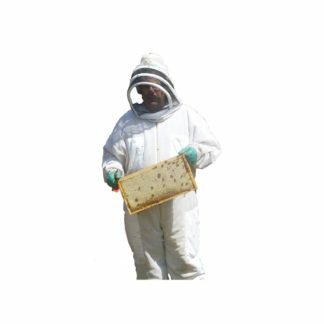 Been using my bleach and water fine mist sprayer to Keep on top of my beekeeper hygiene – spraying tools, suit and gloves – handy to keep a roll of paper towels in my beekeeping basket. Thanks for your support Gilbert!!! Wow 3000 clicks on this story!!! Beneficial bacteria in the bees gut is killed by Glyphosate a new study from the university of Texas revealed. 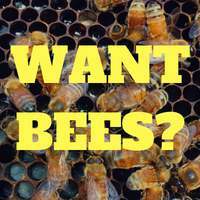 Which makes bees more susceptible to diseases. Two other studies one from China revealed bee larva took longer to hatch and more likely to die and another study from the University of Buenos Aires (Sep 2015) study that proved it affects the bee navigation. How many more studies do we really need? It now seems that we have to add glyphosate to the list of problems that bees face. This study is also further evidence that the landscape-scale application of large quantities of pesticides has negative consequences that are often hard to predict. Claims that glyphosate has a negative impact on honey bees are simply not true. No large-scale study has found any link between glyphosate and the decline of the honeybee population. More than 40 years of robust, independent scientific evidence shows that it poses no unreasonable risk for humans, animal, and the environment generally. Gary Fawcett Wow what a shock, I thought it was safe to spray everywhere #sarcasm, it amazes me to hear people spray this around they beehives. Trish Stretton Makes me wonder if the problems People have with gluten intolerance is also due to the fact that wheat is sprayed with this stuff to make sure it is all dried to the same point prior to harvesting. 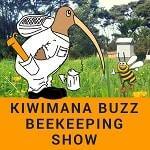 Maybe Dennis Murrells experiment with Kombucha misted on the bees to aid their immune system is something to try. I think I'll give it a go this year. Bryan Mitchel Not a surprising scientific revelation. Glyphosate is simply overused. And GMOs over promoted Both are detrimental to this world. Margaret Groot Yeah I feel it's all connected – to the declining insect populations – decline of some Bee species – to sickness in children – loss of fertility in men as what is happening in UK – to soil degeneration – loss of forests – water quality poisoning aquatic life…..what the heck !! Oh and I forgot to mention …plastics !!! 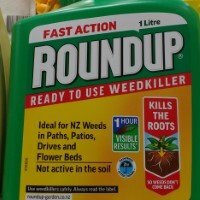 interestingly the contractors for Auckland Council who apply Roundup should be registered as users, therefore they should know that Roundup is not to be sprayed in ditches or drains as it is harmful to aquatic life and all drains lead to waterways but what I see them do is spray heavily. On the sides or verges of highway 18 to North Shore the Phormium flaxes look very sick and as there are Pukekos around there I reckon roundup is a no no. 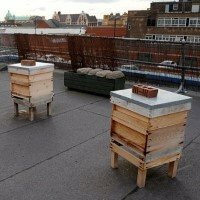 Rising above, there is a quiet buzz with rooftop beekeeping in the UK. Some great photos with this article. 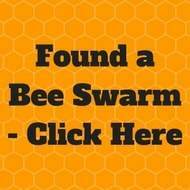 Also interesting info about foraging results and resurgence in beekeeping in Hull. Few people will be aware that for the past couple of years the roof of the Prospect Centre has been home to the hard-working insects. 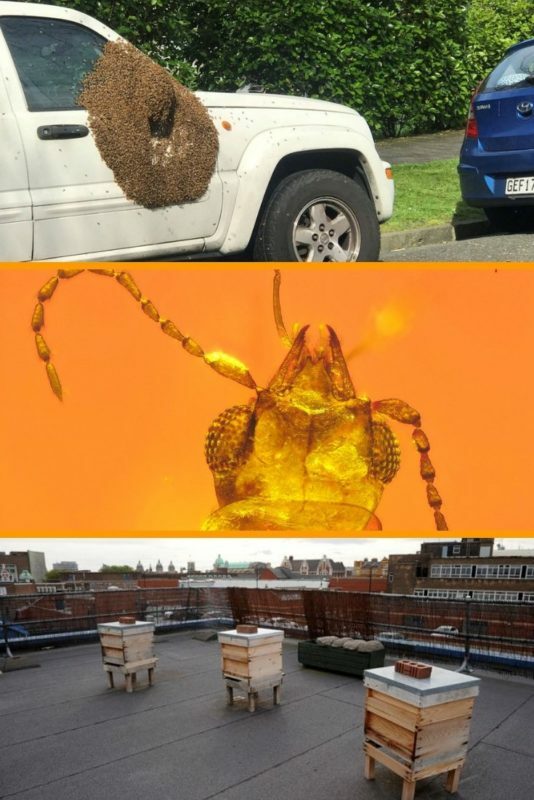 Three or four hives – each containing up to 50,000 bees – have been placed on the roof. Evidence of how plants were pollinated during the Cretaceous period in northern Myanmar’s Kachin State. Has been discovered embedded in Amber. 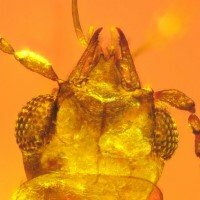 Almost 100 million years ago, a beetle had a bad day, became caught in some tree resin and was asphyxiated. Gymnosperms had a simple fertilisation strategy, unfertilized seeds were exposed to the air awaiting pollinators. Descendant of Gymnosperms still exist such as Conifers, gingkoes and cycad. This happened in early October. 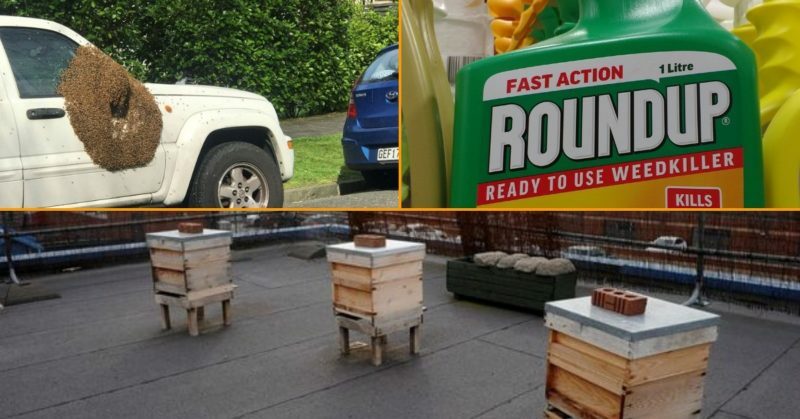 The homeless in Auckland are moving into cars….bee wary if you leave your car parked up for awhile….but this is not humans but Bees you need to watch out for. 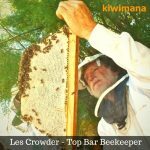 This article shares about Spring swarming and the interest and fascination,swarms create with not beekeepers. He (the owner ) initially thought someone had broken into his car as a lot of people were standing around it, he said. He went on to say…“It's insane,” Martin said. Fiona Small My hobby hive swarmed yesterday (was a little late with giving them more space… they're pumping!) and luckily they didn't go far so I nabbed it before they decided to up sticks somewhere else. Phew! 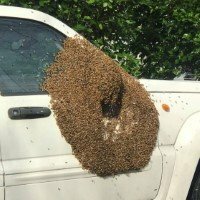 That evening my sister in law said she drove through a swarm in Torbay too! My inexperience! I have been recently challenged by the varroa mites and small hive beetles. 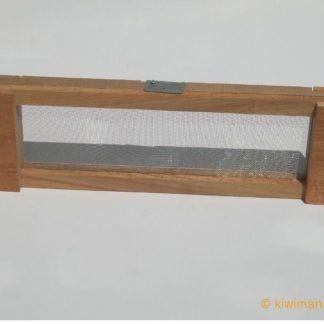 I have done an initial hive treatment with oxalic acid for varroa mites and traps for beetles. I have also been treating around the hives with diatomaceous earth. Any other suggestion? 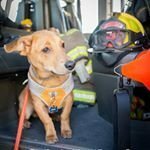 This month we have an amazing new supporter. 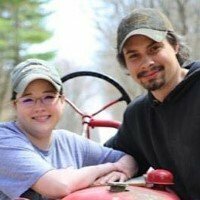 Thanks to Daniel and Christie Bokros from Ohio for becoming a new supporters on Patreon. Driving several hours today with my mom. 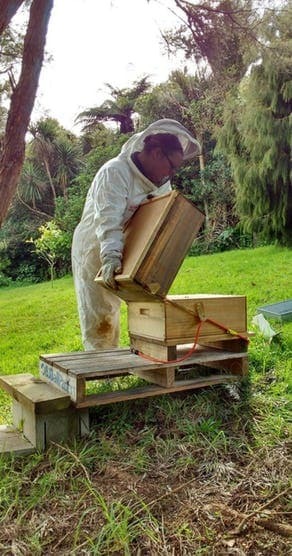 (She got me into beekeeping when I was just a young shaver.) Across Ohio today, it will be Kiwimana all the way! She liked the show very much so! She said she learned a lot and really enjoyed your delightful banter. 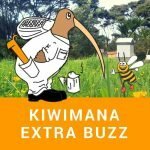 This week we are talking about Droughts for the Australian Beekeepers and why you need to tell your bees. The bonus show is for our amazing supporters. So did you enjoy our latest show??? If you want to the next show to automagically appear on podcast listening device, please subscribe in your podcast device.